An app made by the Samaritans that was supposed to detect when people on Twitter appeared to be suicidal has been pulled due to "serious" concerns. The charity's app was meant to use an algorithm to identify key words and phrases which indicated distress. But in practice, some said the app made those with mental health issues feel more vulnerable. The Samaritans apologised to "anyone who has inadvertently been caused any distress". "We have made the decision to suspend the application at this time for further consideration," said the charity's policy director, Joe Ferns, in a statement. "Our primary concern is for anyone who may be struggling to cope, including those with mental health conditions. 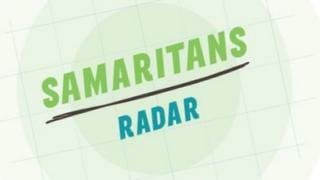 "We are very aware that the range of information and opinion, which is circulating about Samaritans Radar, has created concern and worry for some people and would like to apologise to anyone who has inadvertently been caused any distress. "This was not our intention." Launched last month, the Samaritans Radar app analysed Twitter accounts for phrases like "tired of being alone", "hate myself", "depressed", "help me" and "need someone to talk to". Users who have signed up for the scheme will receive an email alert if someone they followed tweeted such statements. While Samaritans Radar only monitored tweets that were publicly available, some found the level of analysis unsettling. A petition calling for Radar's closure read: "While this could be used legitimately by a friend to offer help, it also gives stalkers and bullies and opportunity to increase their levels of abuse at a time when their targets are especially down. "Just as bad, not everyone apparently wanting to help may be able to do so effectively or has the person's best interests at heart." In other cases, the Radar app was mocked due to false positives. Moreover, data protection experts had raised concerns over the monitoring process. Jon Baines, chairman of the National Association of Data Protection and Freedom of Information Officers, said he believed the app "had been released without adequate assessment of its impact on people's privacy". Despite the suspension of the app, the Samaritans' Mr Ferns defended the charity's track record experimenting with new technology. "Samaritans has a history of innovating to meet the challenges of providing a safe, relevant and effective service to all those we exist to support and we will continue to do this and learn from the work we do. "We will use the time we have now to engage in further dialogue with a range of partners, including in the mental health sector and beyond in order to evaluate the feedback and get further input. "We will also be testing a number of potential changes and adaptations to the app to make it as safe and effective as possible for both subscribers and their followers." Samaritans suicide prevention app: what we've learnt?